NB: There is some controversy about whether this lineage below goes back to Gauss, or to Copernicus, or to both. The genealogy tree changes every year or two as experts research and discuss this. I will provide one branch (to Gauss) below, although sometimes the Mathematics Genealogy page says the Copernicus branch is more likely. I would consult them for the latest opinion. See Ben Kuiper's page for a detailed argument that Gauss was my Great8-grand Advisor: i.e., Gauss was my great-great-great-great-great-great-great-great-grand Advisor. 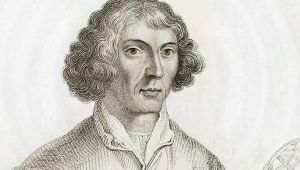 Since some ancestors have two advisors, Copernicus is there too. I have not constructed a lineage for my postdocs but that would be interesting to do. (1) Since I did not do a postdoc, would I be the root of that tree? (2) Are Ph.D. students of former postdocs considered `descendents'? (3) If so, the relations postdoc1 and Ph.D1 do not commute, but in terms of closeness are they to be treated differently? (4) Which is more closely related, a postdoc4 or a Ph.D.4 descendent? (5) More generally, which is more closely related, a postdocn Ph.Dm, or a postdocm Ph.Dn, descendent? AUTHOR: Horn, Berthold K. P.
TITLE: Shape from shading; a method for obtaining the shape of a smooth opaque object from one view. * gives M. Minsky's Advisor as John Wilder Tukey (Ph.D. Mathematics, Princeton, 1939, "On Denumerability in Topology"). Correction: Tukey was also a student of Lefschetz. Tucker, in an interview , states that he was Minsky's advisor, and that Tukey also read his dissertation. ** shows a degree of L.L.M. under Hausen in 1737, same university. *** shows an M.S. at Wittenberg in 1712, advisor not known.